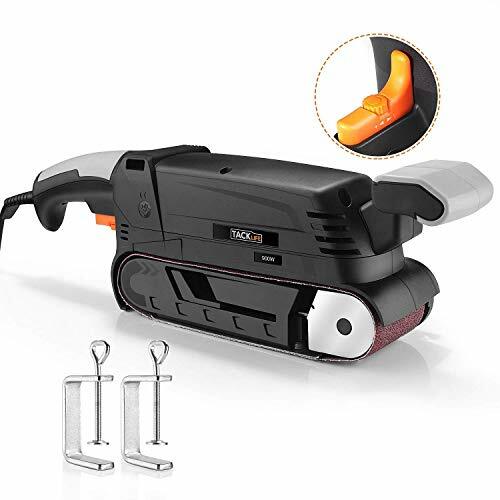 2 In 1: Bench & Belt Sander Equipped with two metal screw clamps, Tacklife belt sander can be turned over and fixed to table, acting as a bench sander, lock-on button helps to free your hand, providing more convenience and flexibility. 13Pcs Sanding Belts Come with 6pcs 120 grit and 7pcs 80 grit aluminum oxide sanding belts, saving your money, meeting the requirements for your different projects. Metal clamping lever for easy and quick sanding belt change. 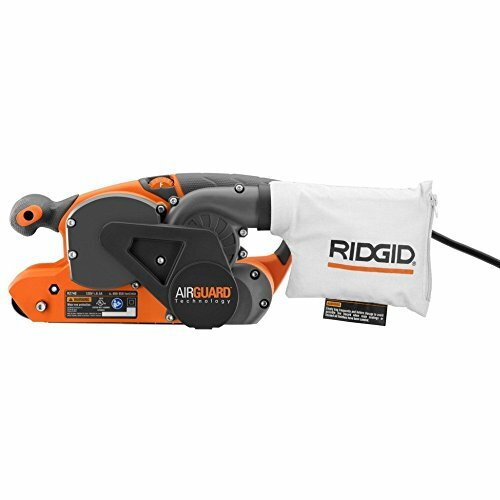 Power & Variable-Speed Design 5 Amp motor offers great power to the sanding surface, delivering efficient removal and high quality finish. Variable-speed knob with 6 dials enables you to match the best speed to the application from 0-560rpm. High Performance Dust Collection System The dust collecting box is detachable, can be easily installed and removed, easy to clean dust. Two vacuum dust adapters, 32mm and 35mm make it possible to connect your vacuum cleaner, reaching the perfect dust collection effect. Notes & Full Package When meeting the problem that the belt slipping, adjust the screw at the bottom to a proper position, then the belt will run in track. Full package: Tacklife PSFS1A belt sander; 13pcs sanding belts; 2 screw clamps; 2 vacuum adapters; user manual; 24 months warranty card. 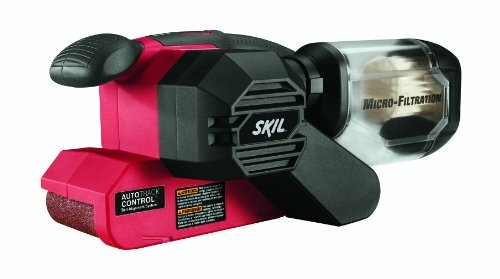 The SKIL 7510-01 3-Inch by 18-Inch Sandcat Belt Sander introduces the innovative pressure control electronic feedback system to enhance the results of your projects. Featuring a 6 Amp motor and Micro-Filtration, this sander is loaded with features that will make your project an enjoyable one. Remember when you needed a versatile and reliable sander? The wen 3 x 21-inch 7-amp heavy duty belt sander debars jagged splinters, strips paint and finishes edges with ease. The high power 7-amp motor spins the belt at a rate of 820 feet per minute for fast and easy material removal. The front roller extends past the top edge of the housing, allowing the belt to reach and sand even the tightest of corners. The sander weighs in at a mere six pounds, limiting the fatigue of the user during operation due to its light yet powerful design. The lock-in safety feature allows for continuous sanding without requiring a constant grip on the trigger switch. Includes a belt release lever for easy sandpaper changes, a dust bag for minimal clean-up and an adjustment knob to correctly align the belt if needed. 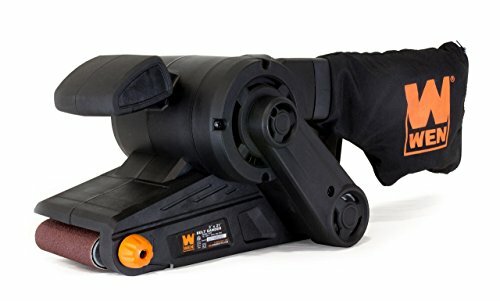 And because this is a wen product, your wen 3 x 21-inch 7-amp heavy duty belt sander comes backed by a two-year warranty, a nationwide network of skilled experienced technicians, and a helpful customer service line. No woodworker's shop is complete without the wen 3 x 21-inch 7-amp heavy duty belt sander. Remember when you could quickly and easily refinish your wood? Remember wen. Makita s 4" x 24" Belt Sander, model 9403, combines power and speed with ease-of-use features and less noise for fast and efficient stock removal. The 9403 is ideal for woodworkers, carpenters, furniture makers, floor installers, deck builders and general contractors who require a best-in-class belt sander. The 9403 features a powerful 11 AMP motor with electronic speed control to maintain constant speed under load, with a 4" wide belt and a speed of 1,640 ft./min. for fast stock removal. The 9403 also features less noise: at only 84dB, it is one of the quietest sanders in its class. Makita's 3 x 21-Inch Belt Sander, model 9903, combines power and speed with ease-of-use features and less noise for fast and efficient stock removal. The 9903 is ideal for woodworkers, carpenters, furniture makers, floor installers, deck builders and general contractors who require a best-in-class belt sander. 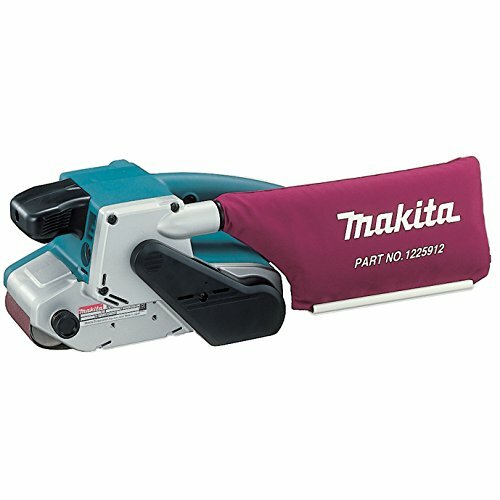 Makita 9903 3 x 21-Inch Belt Sander, abrasive belt and dust bag. What is unique about our PSFS2A belt sander? Come with 2 screw clamps make it not only a belt sander but also a bench sander. Pay for one, but you will get two. 7.5Amp motor offers powerful strength to the sanding pad, meeting your needs to different applications. Bigger 3 21-inch sanding belt making your work more efficient, finish the same job within shorter time. Features a variable speed knob with 13 dials, you can choose the exact speed for your job. The trigger lock will help you to free you hand when it acts as a bench sander. A detachable dust collector makes cleaning work more easier and quicker. Two vacuum adapters, 32mm and 35mm making it possible to attach your own vacuum cleaner, maintaining a tidy environment. Soft rubber covered handle offers a comfortable grip, reducing fatigue for long time work. 9.84feet power cord offers flexible operation and organization. The quick release sanding belt makes adjusting grits and swapping sandpapers easier. If the belt is off track, what should I do? There is an orange adjusting screw at the bottom of the machine, when the belt is off track, pls adjust the screw to a correct position, then the belt will run in track. But pls attention, avoid excessive adjustment, Or the belt will be too tight and broken during working. 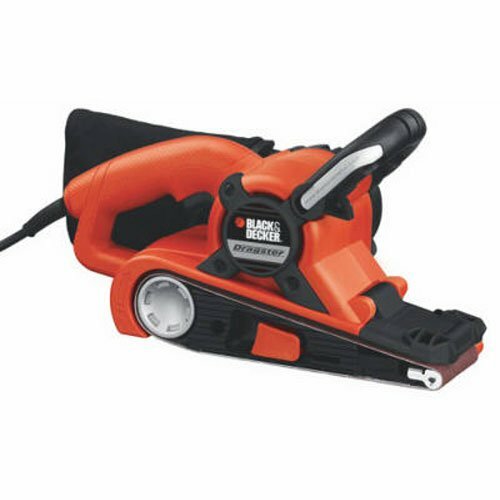 Powerful Work 7.5Amp pure motor provides strong power to the sanding belt, offering more efficient removal. Larger 3 21-inch sanding belt will finsh the same work within shorter time. 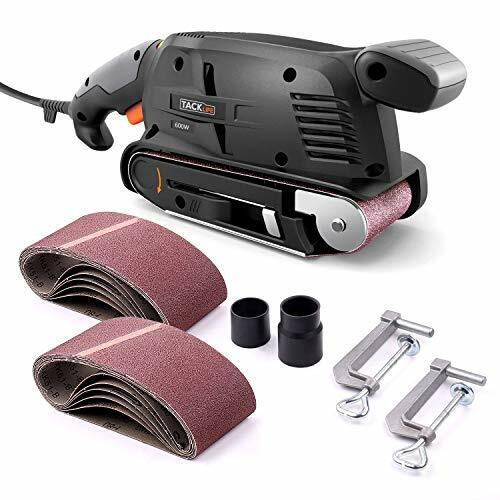 Bench Sander Come with two screw clamps, it can be turned over and fixed to table and act as a bench sander, providing more convenience and flexibility. Variable Speed & Trigger Lock Speed setting knob with 13 speed dials makes it runs from 450 to 750rpm, enabling you to match the exact speed to your applications; Trigger lock will help to free your hand when work as a bench sander. SDS Clamping Function When the sandpaper runs with deviation, the adjustament knob will help you to adjust the sandpaper runs in the right track. But pls avoid excessive adjustment, or it will casue the sandpaper broken. Extensive Application Ideal for sanding wood, glass, tile, metal and other materials; Big dust collector can hold the dust for a large project, vacuum adapter will help to attach your vacuum cleaner, maintaining a clean working space. The Astro Pneumatic 3036 Air Belt Sander (10 x 330mm) with 3pc Belts (#80, #100 and #120) simple belt tension lever. Non-slip handle grip. Variable speed control. Increased pulley space for new thicker belts. Unit comes with: 1 - Sanding Belt 80 Grit - 10mm x 330mm, 1 - Sanding Belt 100 Grit - 10mm x 330mm and 1 - Sanding Belt 120 Grit - 10mm x 330mm. SPECIFICATIONS: Free Speed: 16,000rpm, Size of Belt: 10mm x 330mm, Average Air Consumption: 4cfm, Overall Length: 12.59" (320mm) , Net Weight: 2.09lbs (0.95kg), Air Inlet: 1/4", Air Pressure: 90psi. 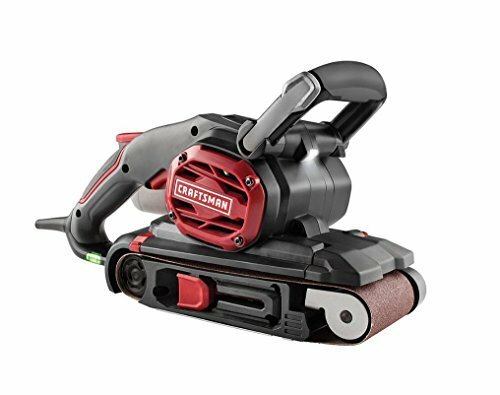 The Craftsman belt sander has a variable speed design to help you better control your accuracy and allows you to sand many types of materials. The adjustable auxiliary handle gives you even more control. 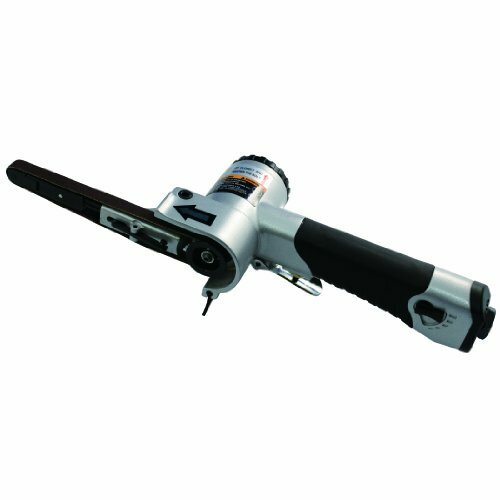 This belt sander is ideal for removing different materials, evening up door edges and preparing floors. Vibra Shield grip design ensures comfort during any sanding project, while the LED work light illuminates your work surface. Makita's 1-1/8 x 21-Inch Belt Sander, model 9031, combines speed and a compact design with ease-of-use features for sanding in confined spaces. The 9031 is ideal for detail work, including fine carpentry and furniture making. 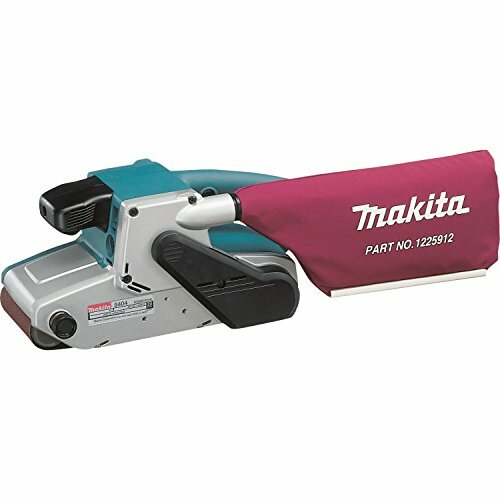 Makita 9031 1-1/8 x 21-Inch Belt Sander, abrasive belts. Power of 600W, high speed of belt 170-250m/min, 7 adjustable speeds, no-load speed of sander 360-560rpm. It comes with 11 sanding belt, 6 belts of 80 grains and 5 belts of 120 grains. Screw clamps allow it to be fixed on table and performed as a sand platform. SDS sanding system, easy to replace belt paper. It is incorporated with a switch for a long work. Comes with dust box, adapter to connect with a vacuum cleaner. Soft grip provides a comfortable grip. The belt sanding is 75 x 457mm, suitable for high tension and wide area operation. Because of the design principles, it's normal that the sanding belt will deviates from the sander with long time working, so it also designed with the adjuster screw. If the belt doesn't run centrally, please stop working and turn the adjuster screw until the belt is parallel to the bases or the black border, please adjusting the belt in time. 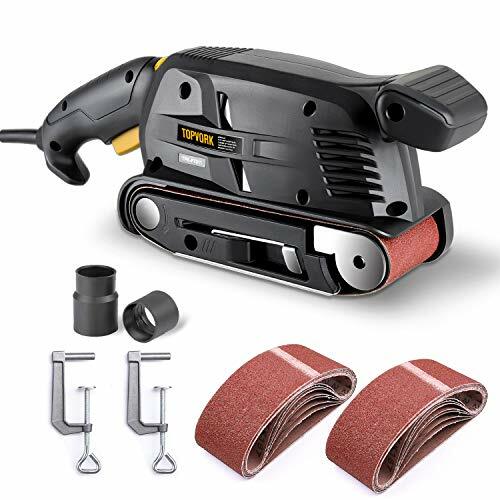 The SB8V2 Variable Speed belt sander Sands wooden and metallic surfaces, finishes flooring, prepares surfaces for painting, removes rust and old paint, and finishes masonry materials such as slate and concrete. How To Deal With The Belt Slipping? 1. Invert the belt sander. 2. Press the trigger and trigger lock to keep the machine idling. 3. Adjust the screw at the bottom to a position where the sandpaper will not run out of track, then adjustment finished. Please pay attention to the arrows in the sanding belt and machine, install the belt in the same direction with the machine, avoiding fracture of the belts, keeping the belts a longer service life. What You Get--1pc Belt Sander, 14pcs 80# 3x18 inch sanding belt, 2pcs fixed screw clamp and 1pc vacuum adapter. 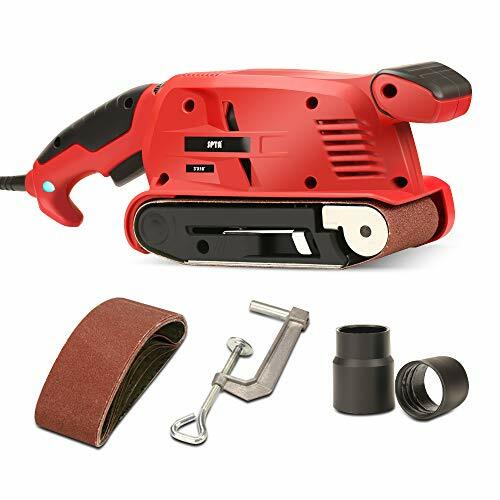 Belt and Bench Sander--Equipped with two metal screw clamps, SPTA belt sander can be turned over and fixed to table, acting as a bench sander, lock-on button helps to free your hand, providing more convenience and flexibility. Variable-speed Control--Variable-speed knob with 6 dials enables you to match the best speed to the application from 0-560rpm. 5 Amp motor offers great power to the sanding surface, delivering efficient removal and high quality finish. Detachable Dust Box--The dust collecting box is detachable, can be easily installed and removed, easy to clean dust. Two vacuum dust adapters, 32mm and 35mm make it possible to connect your vacuum cleaner, reaching the perfect dust collection effect. 14 Belts & Easy To Replace--Come with 14pcs 80# 3x18 inch sanding belts, saving your money, meeting the requirements for your different projects. Metal clamping lever for easy and quick sanding belt change. 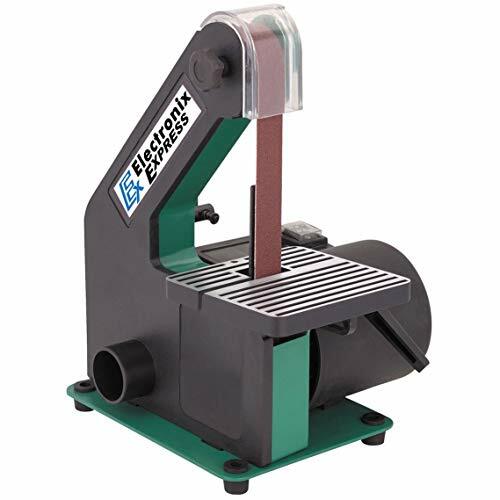 Belt Sander Size: 1" x 30"
458-9032 Features: -Lock-on button. -Multi-position side handle. -Connects to dust collector for a cleaner work environment. -Narrow belt and exposed front pulley for use in close quarters or on irregular shapes. Generic Specifications: -Voltage: 115.00 VAC. Dimensions: Overall Depth - Front to Back: -16.5 Inches. Overall Product Weight: -7 Pounds. Makita's 3/8 x 21-Inch Belt Sander, model 9032, combines speed and a compact design with ease-of-use features for sanding in confined areas. The 9032 is ideal for detail work, including fine carpentry and furniture making. Makita 9032 3/8 x 21-Inch Belt Sander, abrasive belts and 3/8-inch arm assembly. Factory Warranties will only be honored if this product is purchased through an Authorized Seller. Ask the seller if they are authorized before purchasing. The Ridgid Lifetime Service Agreement (LSA) is NOT available on any purchases on Amazon. Product description Includes 6.5 Amp, 3 in. X 18 in. Heavy Duty VS Belt Sander - ZRR2740, 80-Grit Sanding Belt, Dust Bag, Operator's Manual From the Manufacturer Ridgid R2740 Sander, 3-inch x 18-inch Belt has twin fan high efficiency dust collection while one fan cools the motor, the other collects dust resulting in maximum dust pickup efficiency. Soft Grip handles provide increased comfort and decreased vibration, while the 12-foot all rubber cord with cord wrap provides added durability and convenience. Automatic belt tracking automatically adjusts belt to center of platen for alignment. 6.5 amp motor is belt and gear driven for added power and durability. Variable speed dial with electronic feedback matches the speed to the desired removal rate. Electronic feedback helps maintain motor speed under load for consistent results. Flush sanding capability allows for flush sanding against vertical surfaces. Accessible brushes can be serviced quickly for minimum downtime. Tool-free belt release makes changing belts quick and easy. Lighted plug to easily identify live tools. Specifications: Input: 120 V AC, 6.5 Amps, Belt Size: 3 in. x 18 in., Belt Speed (SFPM) 400 - 950 (no load speed), Tool Weight: 5.8 lbs. Includes: R2740 Sander, dust bag 80G sanding belt, and operator's manual. 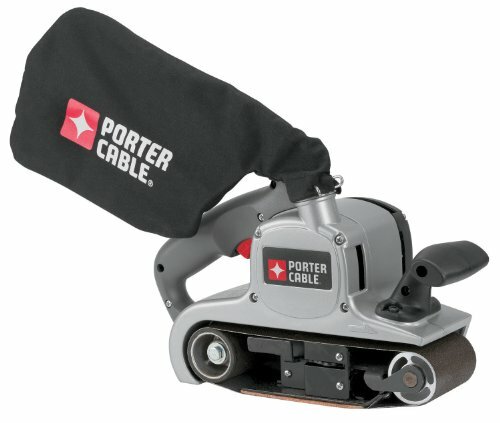 View larger PORTER-CABLE 352VS 8 Amp 3-Inch-by-21-Inch Variable-Speed Belt Sander with Cloth Dust Bag Ideal for woodworking, cabinet making, remodeling, and home improvement projects, the PORTER CABLE 8 amp 352VS 3-inch by 21-inch belt sander is versatile and powerful. Used for heavy stock removal, sanding wood floors, repairing or fine tuning a woodworking project like a table top, the 352VS has been the industry standard for years. Its variable speed dial enables the operator to custom the belt speed to the work from 850-1,300 SFPM, and the quick-release belt-change lever makes belt changes quick and easy. The unit is designed for flush sanding up to vertical surfaces on the open wheel side. An extra large dust bag swivels 360-degrees so it can be moved out of the way in tight quarters. 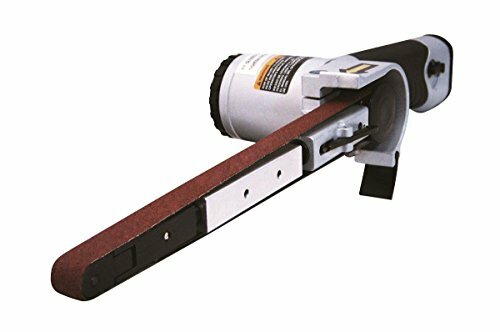 All-Metal Housing PORTER CABLE'S 3-by-21-inch belt sander features an all-metal housing that gives the tool a solid feel, makes it tough to damage, and lets you sand effectively without having to press down. This sander also does a great job of keeping belts centered, a terrific bonus because there's nothing more frustrating that having to constantly re-center a belt. The all-metal housing accounts for the centered placement of the belts. The sander remains rigid, even during heavy use, and the metal helps dissipate heat, keeping the belt relatively cool and in place. What's in the Box Variable-speed belt sander, 100g ceramic aluminum oxide belt, and dust bag assembly #39334. Backed by a manufacturer's 3 year limited warranty. Makita's 4 x 24-Inch Belt Sander, model 9404, combines power and speed with ease-of-use features and less noise for fast and efficient stock removal. 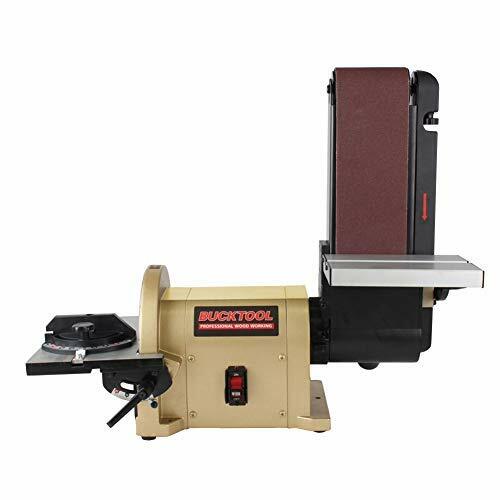 The 9404 is ideal for woodworkers, carpenters, furniture makers, floor installers, deck builders and general contractors who require a best-in-class belt sander. 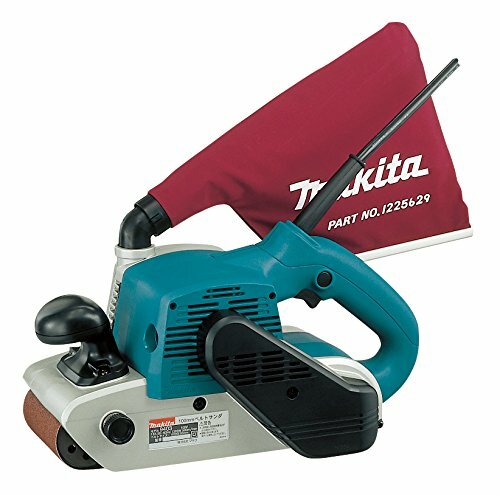 Makita 9404 4 x 24-Inch Belt Sander, abrasive belt and dust bag.